This post will discuss LED PCB board design issue. First of all Allen wants to claim most LED PCB design content from the internet. And this post not only focus designers, because to learn more LED PCB board design, you will understand LED PCB board more clearly, then speed your PCB project. This is especially important if the vias are not masked-over. 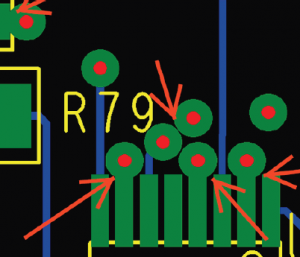 Placing vias too close to SMT pads will allow solder to migrate off the pad and through the via, resulting in a poor solder joint. Edge of via to edge of SMT pad should be .025” or greater whenever possible, and masking over the via pad is recommended. Note how the mask openings for vias and SMT pads run into one another. 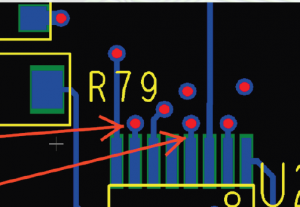 There is nothing to block assembly solder flow. All solder will now stay on the SMT pads. From epectec, original author have all right.